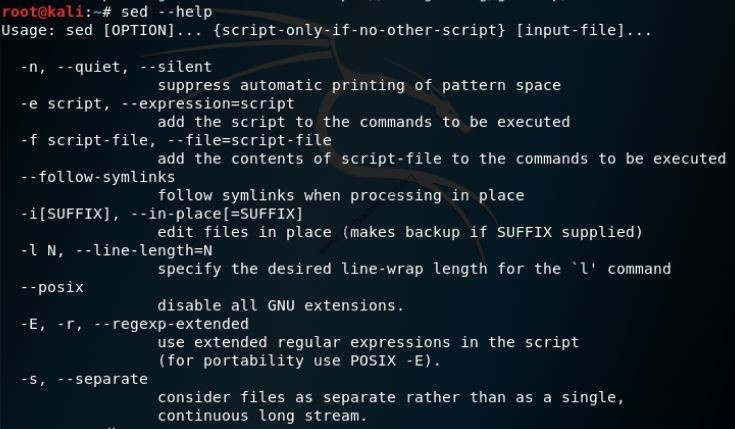 SED is a Linux command which is generally used to edit a file by replacing the string, delete strings and lines without even opening a file and without affecting the original content of file. It is also called Stream Editor. It also allows complex pattern matching which makes this command more powerful. 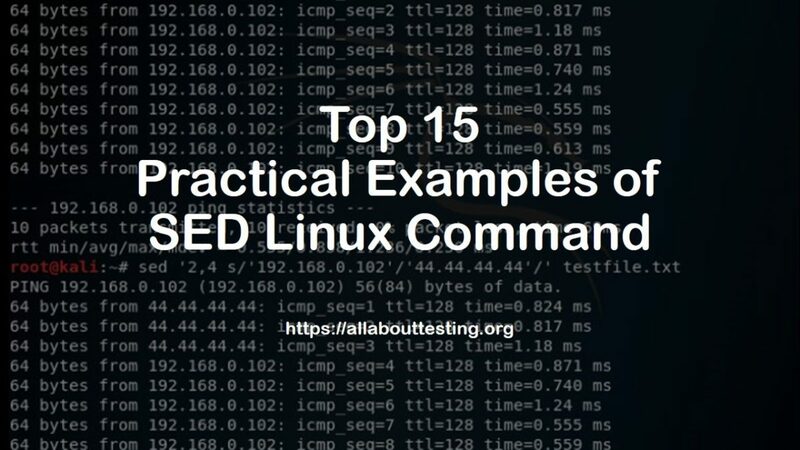 In this article, we will review top sed commands practical examples which helps Linux users to play with files without googling it. (3) Replace strings: sed command is used to replace strings in file. 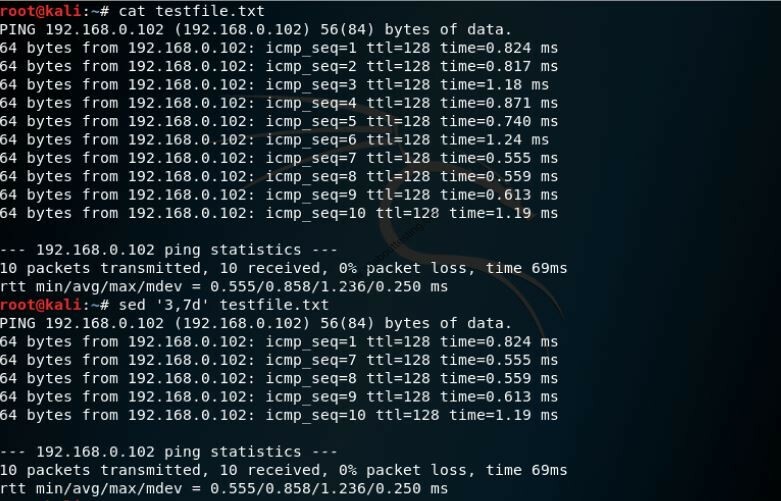 Below example replaces IP ‘192.168.0.102’ with IP ‘98.34.65.34’. 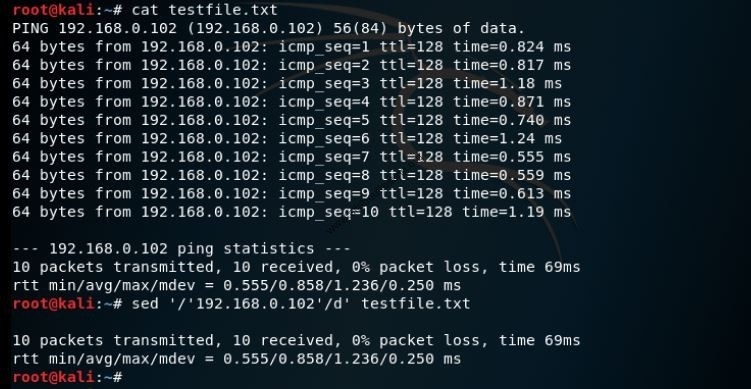 (4) Replace multiple strings by one liner command: Below example replaces IP 192.168.0.102 with IP 98.34.65.34 and bytes with testbytes. (5) Ignore case-sensitive while replacing strings: Use ‘gi’ instead of ‘g’ to ignore case sensitive in strings. Below example demonstrate usage of g and gi at different instants. 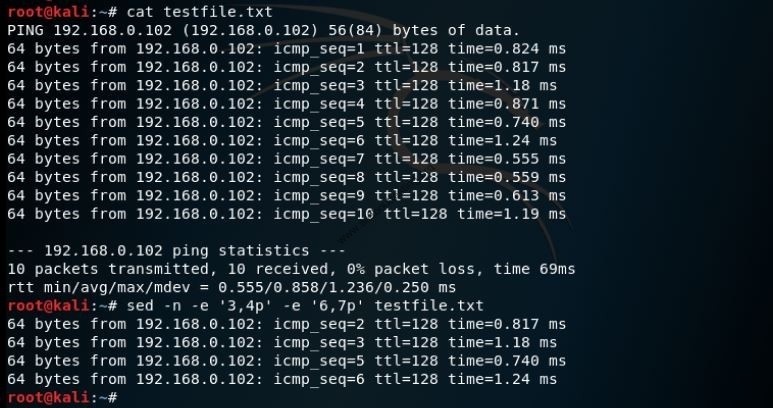 (6) To print range of lines of text file: In below command, user can view content of only line number 3 to 7 of testfile.txt. (7) To delete range of lines of text file: In below example, user can ignore the print of the content of line number 3 to 7 of testfile.txt. 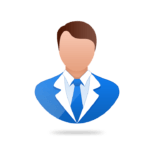 (8) To print multiple range of lines of text file: By using below command, only line numbers 3,4,6,7 print as a output. 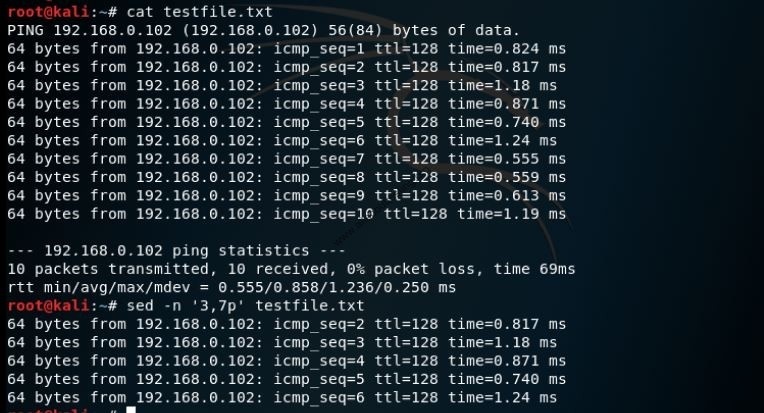 (9) To replace string on a specific line number: In below example, line number 2 replaces IP 192.168.0.102 by IP 44.44.44.44 in output. 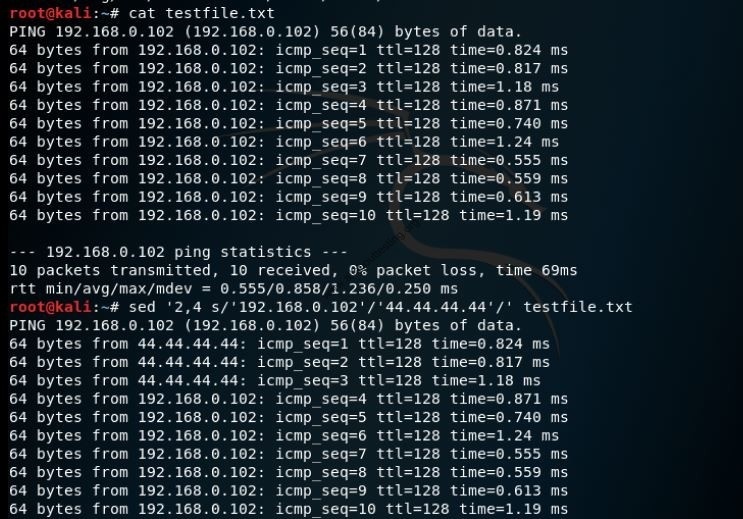 (10) Replace string on specific range of lines: In below example, line number 2 to 4 replaces IP 192.168.0.102 by IP 44.44.44.44 while print on terminal. 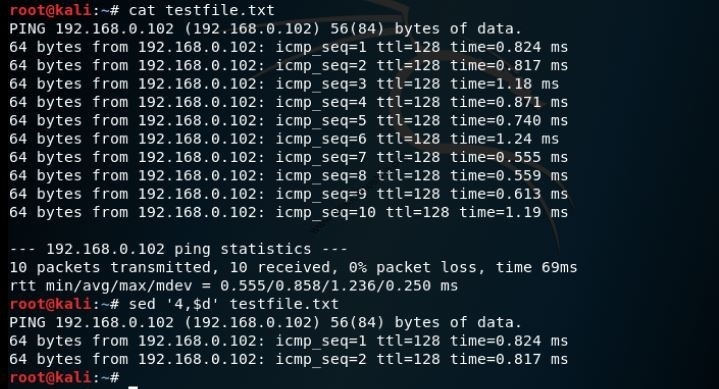 (11) To delete a particular line in test file: Below command deletes 4th line of testfile.txt while print. (12) To delete lines of particular range in a test file: Below Command delete line numbers 4 to 9 while print output. 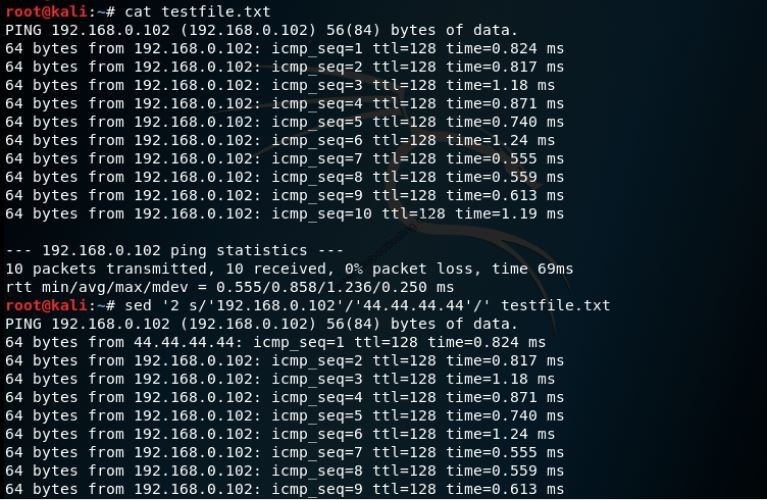 (14) To delete line by pattern matching string: Below command delete all lines containing IP 192.168.0.102 while print output on terminal. 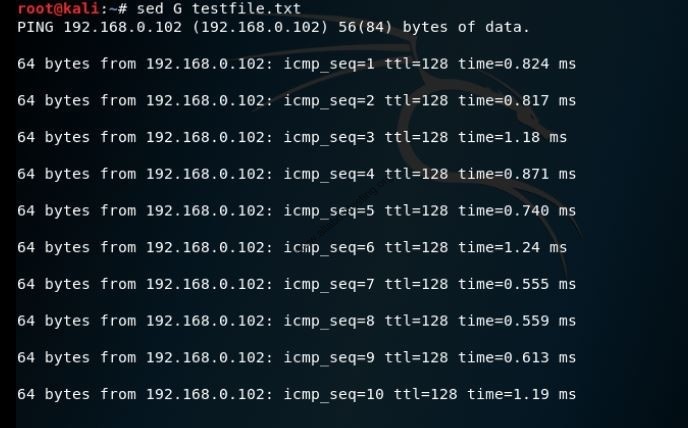 (15) To insert blank lines in test file: Below command is used to insert blank lines in testfile.txt while print on terminal. In this article, we have covered practical examples of sed command. You can be more innovative by constructing commands to achieve desired results.